NORFOLK, Va., Jan. 25, 2017 – Norfolk Southern Corporation (NYSE: NSC) today reported fourth-quarter and 2016 financial results. Net income for the quarter was $416 million, a 15 percent increase compared with $361 million during the same period of 2015. Diluted earnings per share were $1.42, up 18 percent compared with $1.20 diluted earnings per share in the fourth quarter last year. Norfolk Southern announced Tuesday that it increased its quarterly dividend to $0.61 per share, reflecting a 2 cent, or 3 percent, increase over the previous quarter’s dividend. For 2016, net income was $1.7 billion, up 7 percent compared with $1.6 billion in 2015. Diluted earnings per share increased 10 percent to $5.62 compared with $5.10 per diluted share in the prior year. Results for 2015 included restructuring expenses that reduced fourth-quarter 2015 net income by $31 million, or $0.10 per diluted share, and lowered 2015 net income by $58 million, or $0.19 per diluted share for the full year. · Railway operating revenues of $2.5 billion declined 1 percent compared with fourth-quarter 2015, reflecting lower merchandise and coal traffic volume, as well as reduced fuel surcharges. These declines were offset in part by intermodal volume growth that eclipsed the effects of the 2015 Triple Crown restructuring. Intermodal revenues increased to $583 million, a 4 percent gain compared with fourth-quarter 2015. Volumes increased 7 percent, with growth in domestic and international traffic offsetting the Triple Crown restructuring. Coal revenues declined 7 percent to $403 million compared with fourth-quarter 2015. Volume fell 4 percent with an increase in export coal softening the decline in the utility market. Railway operating expenses declined $147 million, or 8 percent, to $1.7 billion compared with same period last year due to targeted expense reductions and the absence of last year’s restructuring costs. Income from railway operations was $761 million, an increase of 19 percent compared with fourth-quarter 2015. The composite service metric, which measures train performance, terminal operations, and operating plan adherence, was 80 percent, a 200 basis point improvement compared with 78 percent in the same quarter last year. The railway operating ratio, or operating expenses as a percentage of revenues, was 69.4 percent, a 510 basis point improvement compared with 74.5 percent in the fourth quarter of 2015. Railway operating revenues were $9.9 billion, 6 percent lower compared with 2015. The decrease was driven by a 3 percent volume decline due to reductions in energy-related markets and the Triple Crown restructuring, as well as reduced fuel surcharges. General merchandise revenues were $6.2 billion, a 2 percent decrease compared with the prior year. Volume declined 2 percent, primarily due to reduced demand in energy markets, and fuel surcharges were lower. Intermodal revenues totaled $2.2 billion, 8 percent lower compared with 2015, reflecting the Triple Crown restructuring, as well as reduced fuel surcharges. International and domestic growth more than offset the volume decline from the Triple Crown restructuring. Coal revenues were $1.5 billion, down 18 percent year-over-year. Reduced utility volumes combined with a weak global export market lowered total volume by 16 percent. Railway operating expenses declined $813 million, or 11 percent, to $6.8 billion primarily due to targeted expense reduction initiatives, lower fuel expenses, the absence of last year’s restructuring cost, and service improvements. Income from railway operations was $3.1 billion, a 7 percent increase compared with the previous year. The composite service metric was 80 percent, an 800 basis point improvement compared with 72 percent last year. The operating ratio for the year was a record 68.9 percent, a 370 basis point improvement compared with 72.6 percent in the prior year. For 2017, Norfolk Southern plans to invest $1.9 billion to maintain the safety of its rail network, enhance service, improve operational efficiency, and support growth opportunities, which is consistent with Norfolk Southern’s total capital investment of $1.9 billion in 2016. NORFOLK, Va., Jan. 24, 2017 – The board of directors of Norfolk Southern Corporation has named six people to new positions and duties, announced James A. Squires, chairman, president, and chief executive officer. · Thomas G. Werner is vice president corporate communications and chief sustainability officer, Norfolk. · C.H. “Jake” Allison, Jr., is vice president and treasurer, Norfolk. · Susan S. Stuart is vice president audit and compliance, Atlanta. · Bruno Maestri is vice president government relations, Washington. · Jerry W. Hall is vice president mechanical, Atlanta. · Karol R. Lawrence is vice president network and service management, Atlanta. Werner joined Norfolk Southern in 1999 as director IT program management. He served in positions of increasing responsibility in the information technology department before being named vice president information technology in 2007. He was named vice president and treasurer, his most recent position, in 2013. Werner holds degrees from Princeton and University of Pennsylvania. Allison joined Norfolk Southern in 1993 as manager audits. He served in audit and compliance, sourcing, and accounting positions before being named vice president and controller in 2009. He was named vice president audit and compliance, his most recent position, in 2013. Allison holds a degree from Virginia Tech. Stuart joined Norfolk Southern in 1985 as an information technology developer. She served in information technology and accounting positions before being named assistant vice president accounting operations, her most recent position, in 2008. Stuart holds degrees from the University of Virginia and Virginia Tech. In 2014, she completed the General Management Program at Harvard Business School. Maestri joined NS in 1995 and served in positions relating to environmental management and protection, and then public affairs, before being named vice president government relations and corporate communications in 2005. He was named vice president government relations, corporate communications, and corporate sustainability officer, his most recent position, in 2015. Maestri holds degrees from the University of Virginia. Hall joined Norfolk Southern in 1985 as a management trainee. He served in a wide range of transportation positions before being named vice president intermodal operations in 2013, and vice president network and service management, his most recent position, also in 2013. Hall holds a degree from the University of Alabama. In 2016, he completed the Advanced Management Program at Harvard Business School. Lawrence joined Norfolk Southern in 2001 as director program management office. She served in planning and technology and strategic planning positions before being named assistant vice president information technology, her most recent position, in 2006. Lawrence holds degrees from Susquehanna University and Villanova University. In 2015, she completed the General Management Program at Harvard Business School. Squires also announced the retirement of two Norfolk Southern executives. · Donald D. Graab, vice president mechanical, Atlanta, retires after 39 years’ service. · Frank S. Brown, assistant vice president corporate communications, Norfolk, retires after 38 years’ service. “We thank Don and Frank for their contributions and dedication -- in the best Thoroughbred tradition -- to Norfolk Southern and those whom we serve,” Squires said. NORFOLK, Va., Jan. 24, 2017 – Norfolk Southern Corporation announced that its Board of Directors today voted to increase the regular quarterly dividend on the company’s common stock by 3 percent, or 2 cents per share, from 59 to 61 cents per share. “The dividend increase reflects our board’s confidence in the company’s strategic plan and demonstrates our commitment to deliver long-term value for our shareholders,” said Norfolk Southern Chairman, President and CEO James A. Squires. The increased dividend is payable on March 9 to stockholders of record on Feb. 3. Since its inception in 1982, Norfolk Southern has paid dividends on its common stock for 138 consecutive quarters. JACKSONVILLE, Fla. – January 17, 2017 – CSX Corporation (Nasdaq: CSX) today announced fourth quarter 2016 net earnings of $458 million, or $0.49 per share, versus $466 million, or $0.48 per share, in the same period of last year. The fourth quarter of 2016 included an operating property sale and a debt refinancing charge, both of which were $0.08 per share and offset each other in the quarter. In addition, the fourth quarter included an extra accounting week resulting from the company’s 52/53 week fiscal reporting calendar, which benefitted earnings per share by $0.03 per share. Including the extra week, fourth quarter revenue increased 9 percent and expenses increased 2 percent. Operating income for the quarter was $1 billion, which included the $115 million gain from the property sale and the $62 million benefit from the extra week. For the full year 2016, the industry continued to face headwinds from low global commodity prices and strength of the U.S. dollar. In this environment, CSX generated $11.1 billion in revenue as volume declined 5 percent overall with a 21 percent decline in the company’s coal business. Even with these ongoing challenges, CSX delivered earnings per share of $1.81, operating income of $3.4 billion and an operating ratio of 69.4 percent. The CSX of Tomorrow strategy drives profitable growth in its merchandise and intermodal markets as the company progresses towards a mid-60s operating ratio longer-term. CSX executives will conduct a quarterly earnings conference call with the investment community on January 18, 2017, from 8:30 a.m. to 9:30 a.m. Eastern time. Investors, media and the public may listen to the conference call by dialing 1-888-EARN-CSX (888-327-6279) and asking for the CSX earnings call. Callers outside the U.S., dial 1-773-756-0199. Participants should dial in 10 minutes prior to the call. In conjunction with the call, a live webcast will be accessible and presentation materials will be posted on the company's website at http://investors.csx.com. Following the earnings call, an internet replay of the presentation will be archived on the company website. 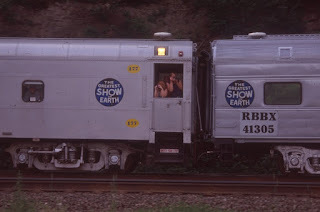 As most of you may have heard or read by now, after May both Ringling Brothers Red and Blue units circus trains will fade into what Willie Nelson sang about in his song "City of New Orleans". In it he said "This train got the disappearing railroad blues." 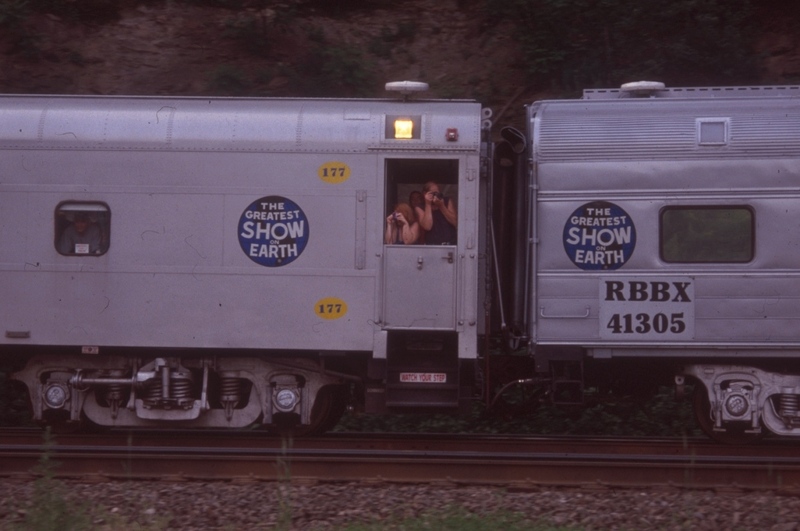 and so will both Ringling Brothers circus trains have those disappearing blues. 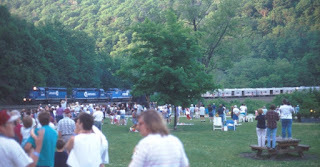 Having chased both trains since 1983 I would like to share some of my photos taken during that time frame. 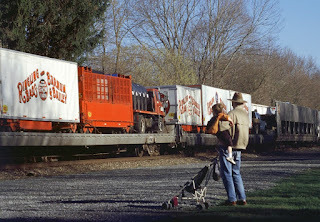 In 1996 I had the opportunity to photograph the circus train going west around Horseshoe Curve. The crowd of people waiting for the train on that day was huge. Passing by the Curve's viewing area people were photographing the train's passage and Ringling Brothers personnel were photographing the crowd from the vestibules. It was an amazing sight to witness that will no longer happen! After closing out NYC's Madison Square Garden, Ringling Brothers Red Unit would pass through Manville (NJ) on June 3, 1985 over what is now CSX's Trenton Line. As it passed by CP WESTON (MP 56), a CP that no longer exists, a member of the show waved from the vestibule to me as he passed by. Bringing up the rear markers on that day of this forty-three car train was a CR caboose! Like cabooses those friendly waves from the vestibules will soon be history. One can also speculate that come May both the Red and Blue units might be traveling over these same tracks to Florida for the very last time after closing out their final shows in Providence (RI) on May 7 and Uniondale (NY) on May 21, respectively. April 11, 2005 would find me once again track side in Stanton Station (NJ) along the Lehigh Line awaiting the Red Unit's passage. On this day the fifty-six car train would be making the 339 mile trip from NYC to State College, PA. A grandfather was out taking a walk with his grandson when he inquired what I was waiting on. I told him Ringling Brothers Circus Train. When the train sounded its horn as it approached the grade crossing, both of them would watch the train's passage with much interest. It will be goodbye to spontaneous sights like that of people of all ages taking time to watch the circus train's passing. In closing I can say that it was a great ride while it lasted and certainly glad that there was enough patience along with perseverance on my part to capture these images. JACKSONVILLE, Fla. – January 11, 2017 – CSX (Nasdaq: CSX) worked with its customers in 2016 to announce 114 new or expanded facilities to be located on the company’s rail network or connecting short lines. These new projects represent $9.5 billion in customer investments that are expected to generate approximately 8,100 new jobs in areas served by CSX. Once these facilities are fully operational, they are projected to generate more than 136,000 new annual carloads for CSX. In addition to these projects that will be built over the next several years, more than 100 customer facilities on CSX began operations in 2016. Since 2000, CSX customers have invested more than $51 billion in rail-served facilities, creating more than 70,000 jobs at those plants, distribution centers and other enterprises across the company’s 23-state network. To support rail-oriented industrial development, CSX’s Select Site program pre-certifies properties that are suitable for manufacturing use. These sites meet rigorous criteria to increase development probability and reduce time and costs for CSX customers. Customers considering a new or expanded facility can learn more about CSX Select Sites at http://www.csxselectsite.com or at www.csxindustrialdevelopment.com. CSX provides service via an extensive network that connects to nearly two-thirds of the nation’s population and serves more than 70 ocean, river and lake ports. CSX can move a ton of freight an average of nearly 450 miles on a single gallon of fuel, and one train can carry the equivalent load of 280 trucks, reducing carbon emissions and wear and tear on public roads. GPCo author offers talk on railroad history! GPCo vice president and author Richard J. 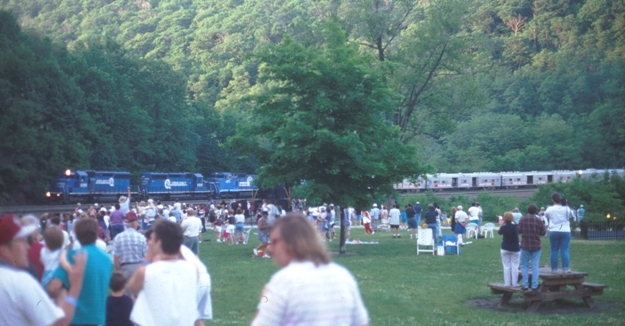 King has long been a historian of railroads of the Catskill Mountain region of New York State, and has amassed a unique collection of images and stories dating back to the 1800s that he will be sharing during his presentation. Rail lines like the Ulster & Delaware Railroad, the Delaware & Northern Railroad, and the Catskill Mountain Railway criscrossed this treacherous, snowy, and mountainous landscape before roads had even reached many of the communities along the rails. The unique challenges faced by construction gangs and train crews to operate and maintain these lines will be explored in the photos and stories of the people who lived it. Attendance is free, and all are welcome! NORFOLK, Va., Jan. 3, 2017 – Norfolk Southern Corporation (NYSE: NSC) will announce its fourth-quarter financial results during a conference call and live Internet webcast at 8:45 a.m. EST on Wednesday, Jan. 25, 2017. Quarterly earnings results will be released at 8 a.m. EST on Jan. 25, and a press release will be posted at www.nscorp.com under the Investors section. Teleconference: 877-869-3847 (please dial in several minutes prior to call start). Live webcast: Go to www.nscorp.com under the Investors section. Presentation materials will be posted at www.nscorp.com in the Investors section. Following the live broadcast, an audio replay of the conference call will be available until Feb. 1, 2017, by dialing 877-660-6853 and access number 13651817. The replay also will be available as an MP3 downloadable podcast in the Investors section of the company's website.